High hopes. 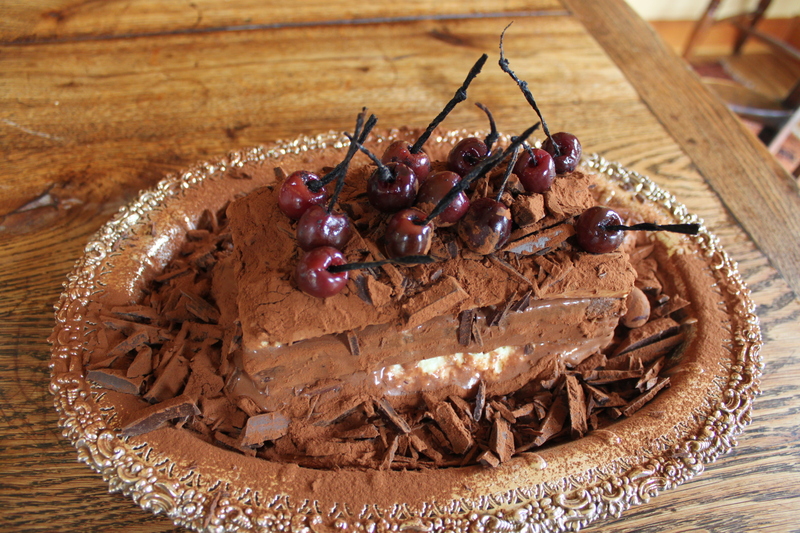 I laid the pieces of my gateau out on the countertop, delicately, like jewels or fine china. There was a madeline biscuit base, a chocolate sponge and a gelatinized Kirsch cream. Behind these sat a jar of cherries in syrup I had canned the day before, a piping bag of chocolate ganache, and a plate of vanilla beans, sliced lengthwise and fashioned into knotted strands to mimic cherry stalks. Continuing with fierce concentration I assessed this mis en place. The only item absent was the aerated chocolate and my heart sunk at the thought of it – what a failure. Heston Blumenthal’s recipe for this particular element does require special equipment including a vacuum cleaner, vacuum-seal storage bag, Tupperware container with a small hole bored into the lid, and a whip cream canister with nitrous oxide cartridges. The process, however, looks simple, deceptively simple. Heston instructs the reader to melt milk chocolate and stir in a little peanut oil. So far so good. Then he tells us to pour this mixture into the whip cream canister, charge with the gas, and spray the contents into the Tupperware container. This I dutifully completed, but then the trouble began. Placing the Tupperware inside the vacuum-seal storage bag and aligning the hole in the container’s lid with the valve in the bag, the reader is then instructed to turn on the vacuum cleaner and place it’s nossle on the bag’s valve. In theory the bag deflates, the chocolate aerates (expanding and becoming riddled with little tongue-tingling bubbles) and the job is done. Being academically inclined, I’ve always found theory less complicated than practice and today was no different. I turned on the vacuum cleaner. Alas, instead of the vacuum-seal bag deflating my Tupperware itself deflated complete with chocolate inside, the plastic container crumpling into a distorted wreck reminiscent of a car that has encountered a solid stone wall; there was no hint of airy, honey-combed chocolate. I tossed the failed aeration away and tried to shrug it off, my ego threatening to deflate in tandem with the Tupperware. All the other components were ready and my spirits rose. 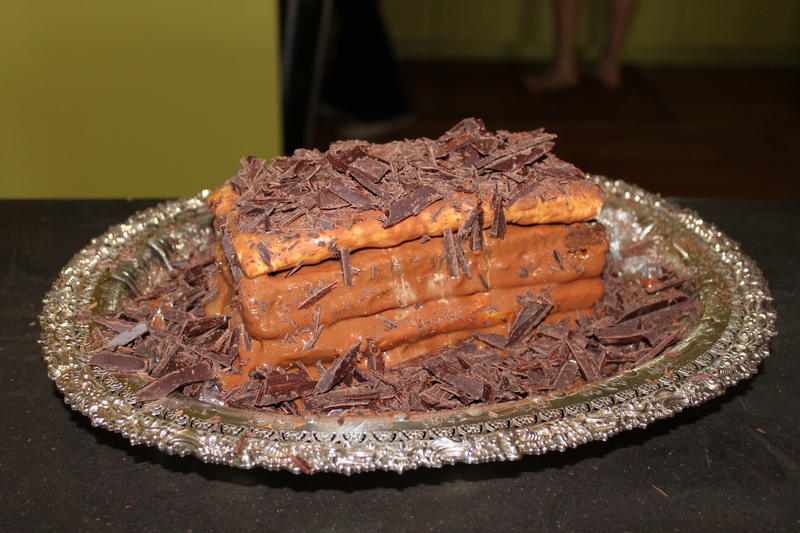 It would still be a beautiful, multilayered cake, even if lacking an element of intrigue that a layer of aerated chocolate might provide. So I assembled the cake in a loaf tin, just as Heston instructs: first the madeline biscuit base brushed with a layer of apricot glaze, then the chocolate sponge sprinkled with Kirsch and cherry syrup, topped by piped strands of chocolate ganache and dotted with cherries, and finally a layer of Kirsch cream. 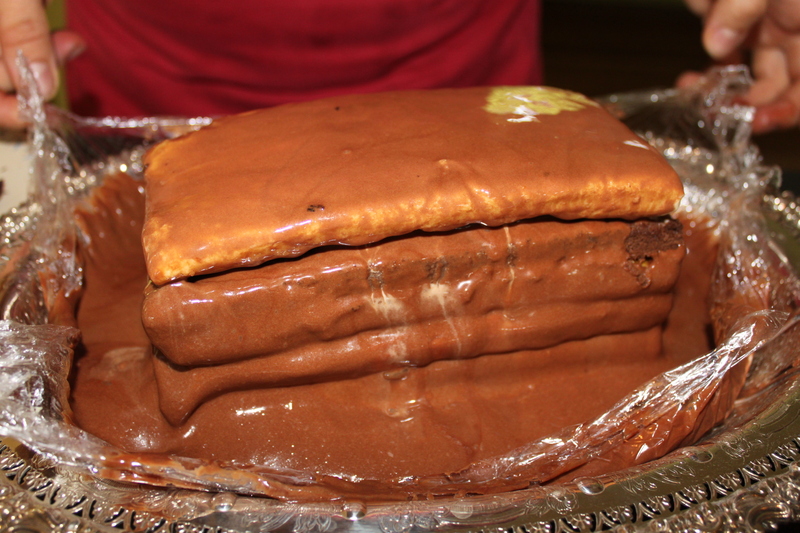 Having made double of each layer I then departed from Heston’s instructions, piling a second layer of each element on top, the resultant cake a tottering tower threatening collapse. 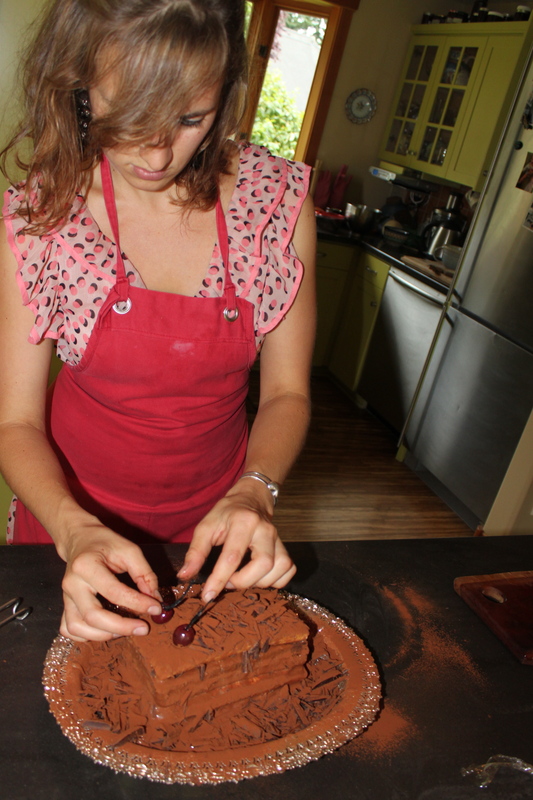 The final step involves making a chocolate mousse and pouring it around the layers (inside the cake tin) and freezing the whole until set. As in any good fable, it is always the last step before reaching the pot of gold at which the protagonist stumbles. My cake might have held together if it had not been for my impatience. Thinking the mousse had set I lifted the gateau out of it’s tin onto a serving platter. Alas, instead of holding firm, the creamy confection dissolved around the cake, oozing earthward leaving my masterpiece naked and swimming in a puddle of dark and glistening chocolate. Like Icarus abandoning his guide I paid the price, the laws of nature triumphing over artifice. 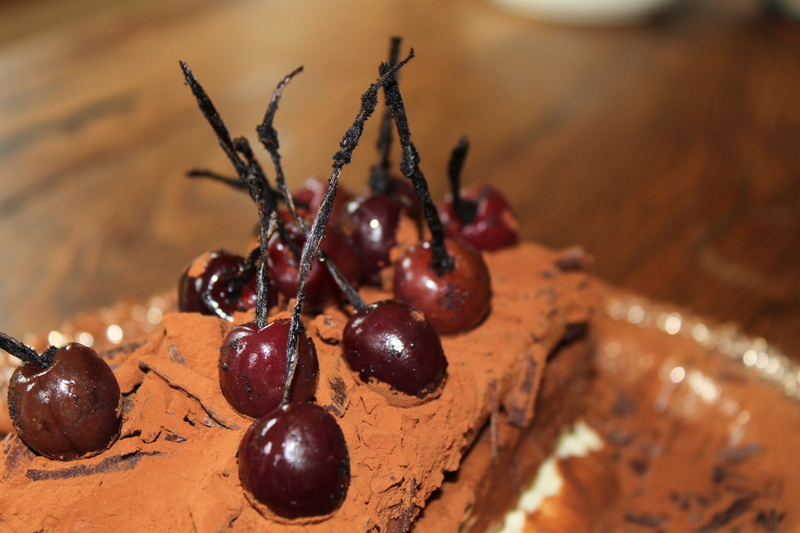 Eventually, I managed to repair the cake to some extent and with the help of chocolate shards, a good dusting of cocoa powder, and garnished with cherries it looked quite beautiful. As I cut into it however, the cake succumbed to gravity again, dissolving into a faintly sickening mass as I sorrowfully served it around the table. Suddenly I was profoundly tired of this food, and thought wistfully of a simple, steaming cherry pie—how much better that would have been—and made a solemn vow to eschew Heston, his vacuum cleaners, and all other forms of culinary pretension for good. Several days later, however, I have had time to lick my wounds. 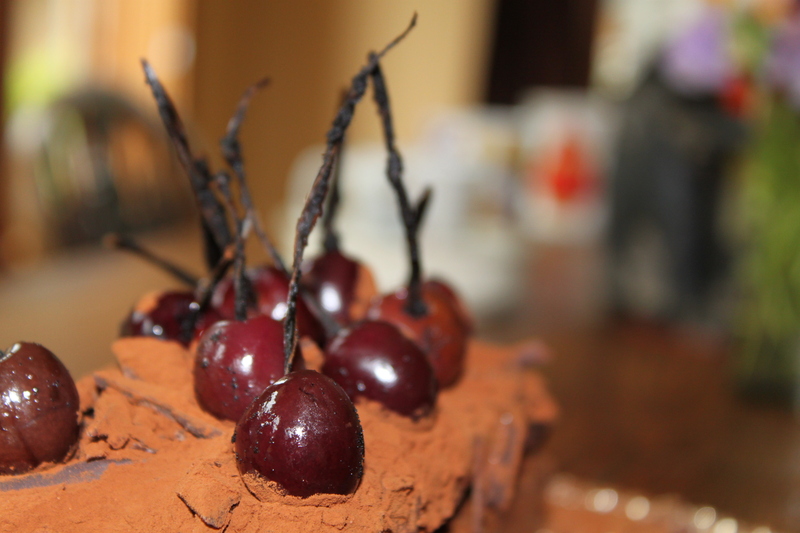 I am still resolved to devote all culinary efforts to good honest food but I am glad I made the black forest gateau. It was never only about showing off; it was also a whole lot of fun. To pour over an unfamiliar recipe, drool over the pictures and search out strange ingredients—all of this is delicious and absorbing. It piques creativity and adds a dash of invigorating frivolity to the kitchen. After all, perhaps that first Egyptian goatherd who tossed some Arabica beans onto the fire was breaking the rules or wandering in rebellion from tradition. We shall never know; but today we have coffee. Is never to feel the burning light. Trying this myself at the moment. There seems to be some contradiction between the various versions of this BFG (TV / book / big book). I used the book. It’s quite a mission to organize all the necessary equipment but the his directions are fairly straightforward. The only part that was a total failure for me was making the aerated chocolate using a tupperware box, vacuum cleaner and vacuum seal storage bag. My tupperware collapsed when I turned the vacuum on so I’ recommend a very sturdy box if you try it. Good luck! I am using the book plus the final stage of the tv series (which is similar to the big fat duck cook book), as the chocloate mousse part seems to be a bit odd, with regards to the finished article. I’ll post you a couple of piccy’s when I’m done. By the way, if you haven’t got the Big Fat Duck Cookbook it’s worth it if only for the pictures.